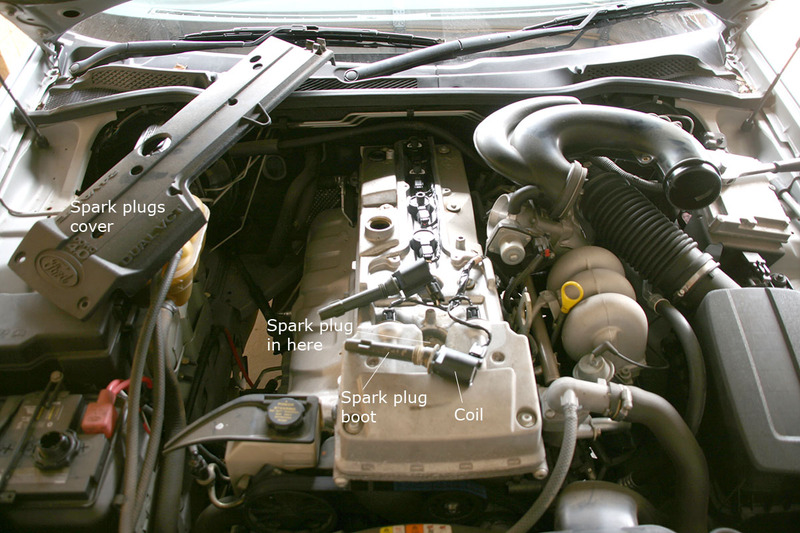 Spark plugs are a consumable, you replace them regularly. So on the Falcon that I'd had for around three years, due for my usual service, I thought it could be spark plug time. Now in the previous year I was going to do it, and spoke to the guy in the auto shop, who told me that spark plugs were around $AUD40 (2012) each! So at least 5 times the price of a "normal" spark plug! "They are Iridium plugs, good for 100,000kms." Hmm, problem for next time. ...and then next time came around. First of all, what is an Iridium spark plug? Well Iridium is an element, a transition metal, like platinum and it is super tough - withstands huge temperatures, very hard - a perfect metal for coating your spark plug anode. It will last for ages! But it is one of the rarest elements on the earth, hence the extra cost. But at least you only have to replace you sparkplugs every 100,000kms. Anyway, I priced some up online. Yes; you can keep your local auto shop alive by paying $40each, or you can have them delivered to your door for around $AU10 (2014) each, and when you need 6 it makes a difference. It's good to support you local stores, to a point. As it was I exchanged a few emails with the online auto shop the guy ended up being even more useful than my local stores - firstly he ensured I had the exact right plug (the plug gap varied all over the place, he looked it up from my VIN number!) and secondly, he warned me about the coils that often in pulling them out the boots tend to fall to bits and to be prepared. He was a good bloke so here's a shout out to Adelaide Parts. But look, I'm skipping ahead. Pop the bonnet on your BF Falcon. Where are the high tension leads? Where are the coil(s)? Where is the distributor? Okay, I haven't seen a distributor in years but if you weren't feeding the car with petrol you'd say it was a diesel. So firstly, you need to remove that black plastic cover on the top of the rocker cover. You'll need to remove the air duct from the throttle body and perhaps wiggle a few other things out of the way. And have some allen keys or sockets handy. Underneath is revealed 12V connections to the top of a coil above each cylinder. Wiggle them out as carefully as you can, if they have already gone brittle then you will break them pulling them out. Mine were all okay, but just be prepared that you might need to get one or two in a hurry. A nice long socket to get out the standard size spark plug, they are pretty deep in there. Replace, reinstall, it all becomes straightforward. So there you have it, the way of the future. A control signal send to a coil pack with built in high tension lead sitting directly over the spark plug. All hidden away under a cover. That only needs a 100,000km replacement. Amazing! Everything you needed to know about spark plugs in a BF Falcon.